On our drive home after leaving the not so exciting Route 6 and finding no place to get more than just a snack, I turned to Untapped to see what local places I could find. It led me to a gem – North Slope Brewing Company. The owner has hired a talented crew and we got to meet one of the brewers. His passion AND knowledge of beer making combines to brew well crafted beer. We have visited a lot of different small breweries and all were good but this one tops the list. Beer was on par with our favorite places like Ommegang and Weyerbacher. This is amazing well crafted beer that you can tell a lot of thought is going into. He is following old school recipes Mountaineer Beer (German Alt) and his brewer partner is creating the most unusual beer – Booyakasha made with cucumber essence that really tastes like cucumbers unlike other cucumber beers I have tried. We even tasted a Cider and by far was the best I have ever had – perfectly tart. And paired with this is amazing fresh food (best bread) coming from the local area. Delicious! Although it is a drive from my home, we will return without question! I highly recommend if passing through, or within a sixty mile radius, that you divert your route past North Slope. Too beautiful of a day to get right in the car.. So just as with any good journey, plans can easily change. A new discovery. Today it was Hills Creek State Park. Although the lake is man made, it is a wonderful, rather remote, and quiet State Park. The lakeside trail loops around the lake: A perfect 3 mile easy hike for a day when you want to take it easy but still enjoy beautiful scenery. We decided it would be the perfect place to camp on a future trip to this area. Two sites along the way worth noting -Marie Antionette Overlook- the view from this overlook beautiful. It would be well worth a return trip to divert off Route 6 to visit the French Azilum that we saw below. We also enjoyed the welcoming town of Wyalusing. We stopped at the River Barge Brewing/Grovedale Winery and were relieved to have found a place to eat. We noticed the Quilted corners of Wyalusing and wish I had this brochure on hand . Although I am not a quilter, seeing these large quilt corners on barns, churches, and other buildings was pretty neat. Perhaps we will return to explore self driving guided tour. 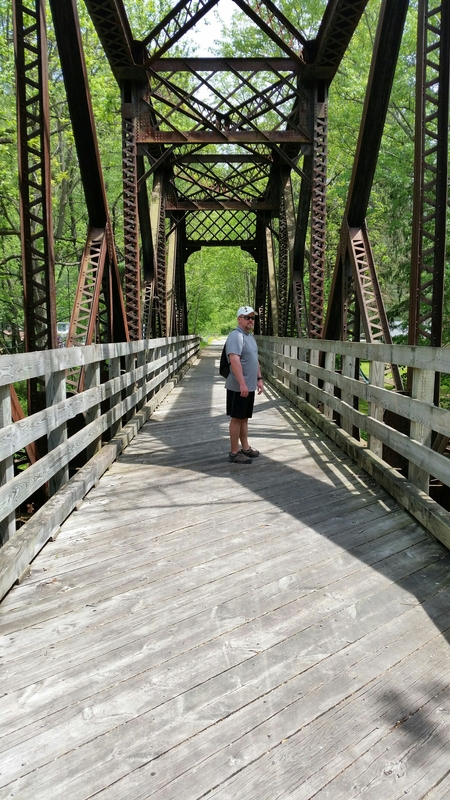 After leaving the Canyon it was time to check out the towns on Route 6… starting with Wellsboro and heading to Mansfield. Unfortunately for a Sunday evening most things were closed. ..
We checked into our very petite and very cheap room at the Microtel Inn in Mansfield… my error in not taking a picture of just how small this one bed hotel room is for there is none on the site. Think room in NYC! However, at that price I wish more hotels would choose this option. Clean, comfortable and good service. For the budget traveler I highly recommend checking it out. We usually do not end a night when travelling at 8 but without much else to do we headed back to our micro room for the night. 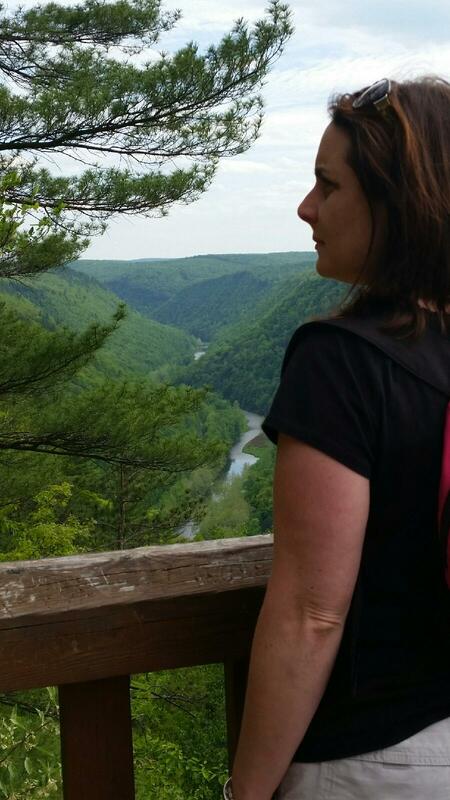 We left the lowest elevation of the Gorge and climbed upward to the scenic view at Leonard Harrison State Park. Amazing. Looking out at the Canyon below and to think at what time this land had been stripped of its trees for lumber and bark for tannins. This is obviously a different canyon then the Grand Canyon we visited in Arizona… but still very beautiful. Beautiful 61 m ile towpath following a creek to the left of Route 44. It has been stated it is one of the”10 great places to take a bike tour.” according to USA Today. 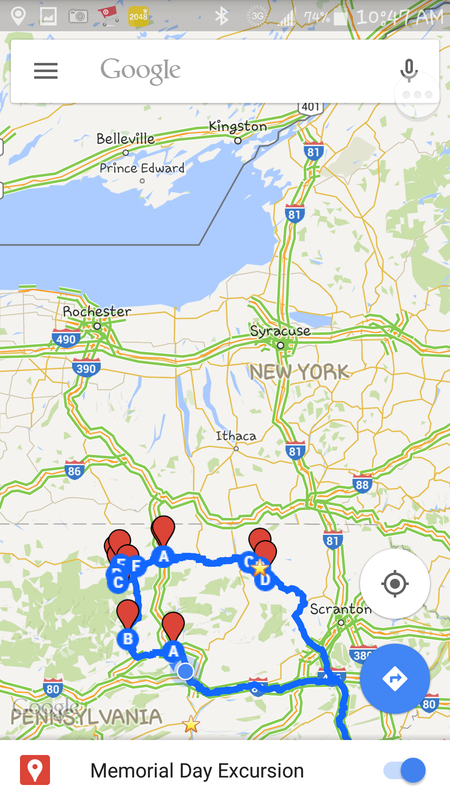 The trails starts at Wellsboro Junction and ends in Jersey Shore, Pennsylvania. The trail is a hard-packed gravel surface great for hiking and biking. We did this as a hike but will definitely come back with bikes for seem to me that is the best way to enjoy… Both entry points entered by foot never revealed the creek and not much scenery besides nice trees and houses – really need go for a long walk or do by bike to see the most beautiful part of it! Great map of the trail can be found here. We stopped at Waterville Tavern for a refreshment. Beginning journey heading West on 80. To think we could stay on this same road and in 2000 miles be in Salt Lake City..a journey Ive done! Our first stop before going North is Brunch at Bullfrog Brewery in Williamstown. .great spot. Will post beers on Untapped.